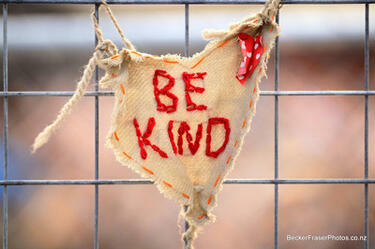 Photograph captioned by BeckerFraserPhotos, "A message on the fence of 2 Sumner Road, Lyttelton". 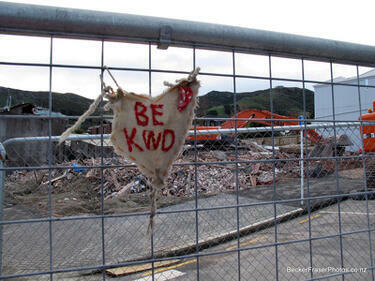 A photograph captioned by BeckerFraserPhotos, "Heart, 'be kind' - at the site of the former Canterbury Hotel, Lyttelton". Photograph captioned by BeckerFraserPhotos, "Knox Church, Bealey Avenue". 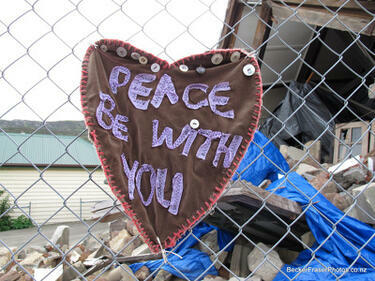 There is a foam heart pegged to the fence reading, "We're all in this together. 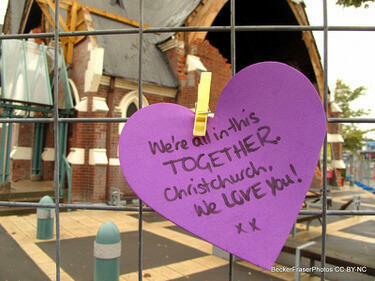 Christchurch, we love you!". A heart shape made from takeaway cups and a heart-shape felt piece, stitched to the wire fence in front of the Volcano Cafe and Lava Bar. On it are the words "Live. Love. Life". Behind is a pile of bricks, a broken fence and a digger can be partially seen. 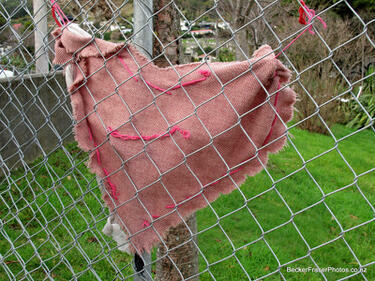 A felt heart on a fence in Lyttelton with the Time Ball and the word "Forever" stitched onto it. 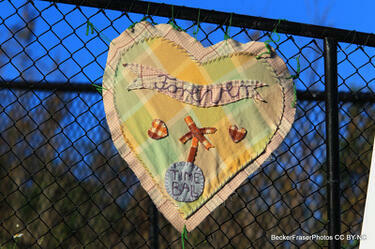 A felt heart on a fence in Lyttelton with the Time Ball and the word "Forever" stitched onto it. Next to the heart is a sign reading, "Danger. 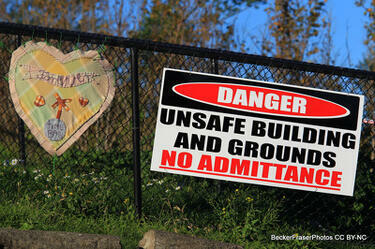 Unsafe building and grounds. No admittance". 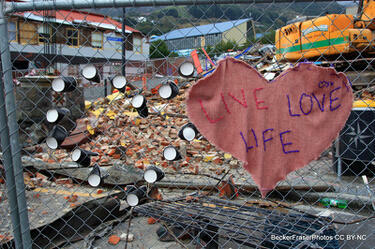 A photograph captioned by BeckerFraserPhotos, "A 'love heart' on the fence around the collapsed Holy Trinity Anglican Church, Winchester Street, Lyttelton". 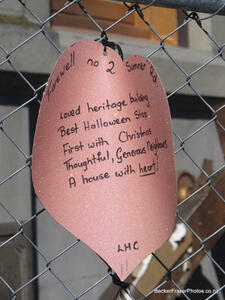 A photograph of paper hearts pegged on the cordon fence around the Chinese Methodist Church on Papanui Road. Quotes on the hearts read, "'Even though I walk through the valley of the shadow of death, I will fear no evil for you are with me.' Psalm 23", "'We can do no great things; only small things with great love.' Mother Teresa, and, "'Peace begins with a smile,' Mother Teresa". 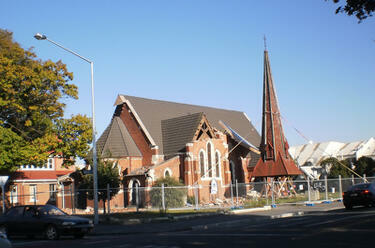 In the background, the earthquake damage to the Christchurch Chinese Methodist Church can be seen. 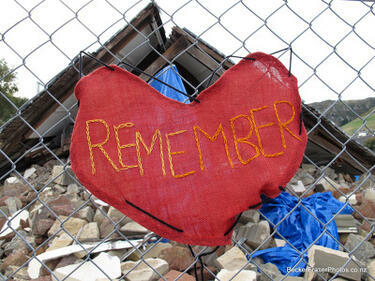 The wall of the gable has crumbled, the bricks spilling onto the grass below. 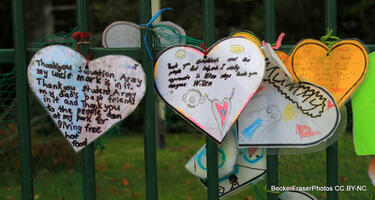 A photograph of paper hearts with inspirational quotes pegged to a cordon fence. In the background, rubble from an earthquake demolished building can be seen. 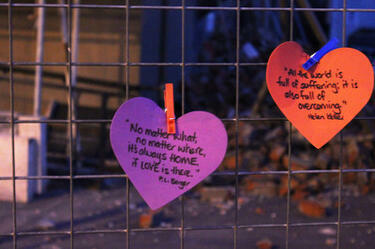 The hearts read, "'No matter what, no matter where, it's always home if love is there.' P.L. Berger" and "'All the word is full of suffering; it is also full of overcoming.' Helen Keller". Photograph captioned by BeckerFraserPhotos, "Knox Church, Bealey Avenue". 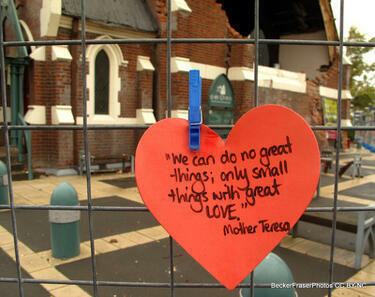 There is a foam heart pegged to the fence reading, "'We can do no great things; only small things with great love' Mother Teresa". 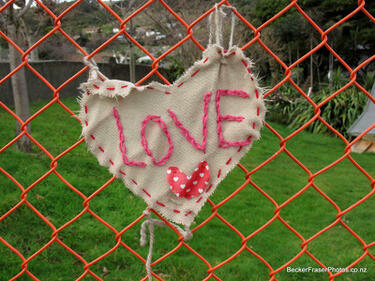 A photograph captioned by BeckerFraserPhotos, "A heart on the fence of St Josephs Catholic Church, Winchester Street, Lyttelton". 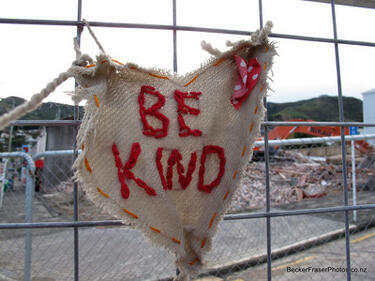 A photograph captioned by BeckerFraserPhotos, " A heart embroidered with 'be kind' at the site of the former Canterbury Hotel, Lyttelton". 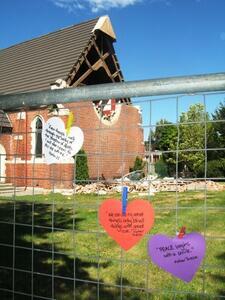 A photograph of the earthquake damage to the Christchurch Chinese Methodist Church on Papanui Road. The gable walls have crumbled, bricks spilling onto the ground. The tower has been removed and braced on the ground in front. 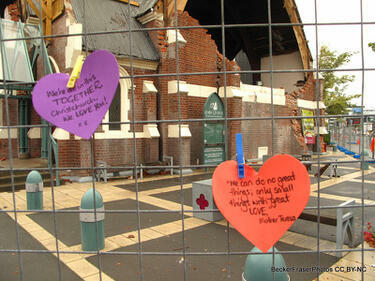 Cordon fencing has been placed around the building. 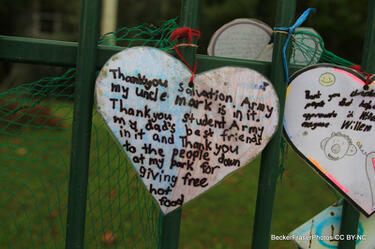 Parts of the fence have been decorated with hearts and the word 'love'.